Home Computer Facts Computer Facts That Will Blow Your Mind First IBM Computer Importance Of Computers Interesting Computer Facts Life Without Computers Shocking Facts About Computers Have You Heard About These 30 Shocking Facts About Computers? 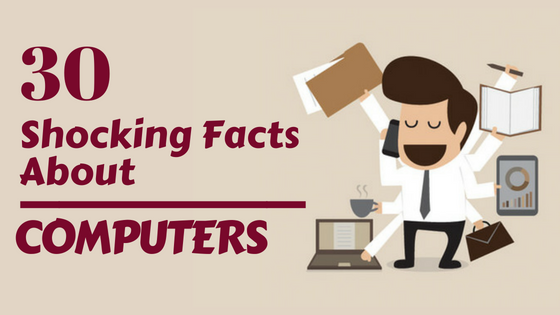 Have You Heard About These 30 Shocking Facts About Computers? None Of Us Can Imagine Our Life Without Computers; It Is One Of The Most Helpful Machines Created That Entertain Us, Ease Our Work And Connects Us With Almost Anyone Through The Internet. No Matter How Many Phones Or Tablets We Use The Importance Of Computers Cannot Be Denied. You Can’t Use A Mobile To Launch A Missile, Can You? The First Ever Computer Mouse Was Created In 1964 Out Of Wood By Doug Engelbart. Every Month More Than 5000 Viruses Are Released While 30,000 Websites Are Reported To Be Hacked Every Day. The First Electronic Computer Was Named ENIAC, And It Weighed Around 27 Tons And Took Up A Humongous Space Of 1800 Square Feet (SF). The First IBM Computer Was Designed And Developed By A Group Of 12 Engineers Who Were Called ‘The Dirty Dozens. The First Hard Disk/Drive Was Developed In 1979 To Ease Users In Storing Their Data, And This Drive/Disk Could Store Data Only Up To 5 MB. While The First Ever 1GB Hard Disk/Drive Was Announced In 1980, And Its Weight Was Around 550 Pounds And Price $40,000. The Longest Word You Can Write Using The Keys In The Same Of The Keyword Is TYPEWRITER. If A Computer Was Designed That Possessed The Same Powers As Of A Human Brain, It Would Be Able To Perform 38 Trillion Operations Per Seconds And Hold Up To 3580 Terabytes Of Memory. It Has Been Reported That 70% Of Virus Creators Get A Contract From Organized Crime Syndicates. The Original Name For Microsoft Windows Was ‘Interface Manager’ Which Was Changed Later. The Common Factor Between HO, Microsoft, And Apple Is That All These Three Companies Started Their Business From A Garage. A 15-Year-Old Boy Hacked Both The Pentagon Weapons Computer And NASA. National Aeronautics And Space Administrations Had To Stop Operations For 21 Days Due To This Hacking. Nowadays, We Use Chrome Or Mozilla Firefox To Browse The Internet, But The First Browser Was Mosaic Developed In 1993. The World Wide Web Came Into Existence In 1990 When Tim Berners Lee Coined It. Check:How To Upgrade Your PC To Windows 10 For Free? The Oldest Website On The Internet Came Into Existence In 1990, And Ran On Usenet And Had Information About An Actress With Beautiful Eyes. This Site Is Known As IMBD. Lenovo Means New Legends; Le Means Legends, And Novo Means New. The Woman Who Is The CEO Of Youtube Is The Same Person Who Gave Her Garage To Larry Page And Sergey Brinn In1998 When They Were Creating Google. If Myspace Was A Country, It Would Be The Tenth Largest One As Approximately 110 Million Users Are Registered On It. Facebook Would Be The 3rd Largest With Over A Billion Users. For 8 Years Long, The Nuclear-Tipped Missiles Of The U.S Had A Password Of 00000000. Most Of The Emails That Are Sent To Us Daily Are Spam-Some 80% Of The Total Mail. Bill Gates The Founder Of Microsoft Was A College Dropout, And His House Was Made Using A Macintosh Computer. Only 8% Of The World’s Currency Is Physical And Real Money, The Rest Exists On Computers Only. The First Microprocessor Made By Intel Was For A Calculator And The Model 4004. Sweden Tops The List Of Most Countries Using Internet With Almost 75% Of Its Population Being Internet Users. Www.Symbolics.Com Was The First Domain Name Ever. 1.06 Billion Is The Number (More Or Less) Of Instant Messaging Accounts That Are Currently There Worldwide. 80% Of All Photos On The Internet Are Of Naked Women. The Email Was There Even Before The World Wide Web Came Into Existence. Google Uses An Estimate Of 15 Billion Kwh Of Electricity In A Whole Year, But Most Of The Electricity Used Is Developed There Only Using Solar Panels. This Usage Is More Than Most Countries Use. So, How Many Facts You Already Know And Which Surprised You The Most? Write In The Comments Below!